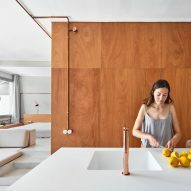 Cement surfaces, wooden joinery, and copper detailing appear inside this Barcelona apartment, which Cometa Architects has designed to subtly draw upon maritime imagery. 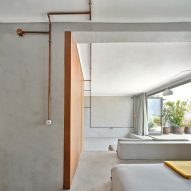 Described as a formally "introverted" space, the top-floor apartment has been revamped by local studio Cometa Architects with industrial materials that reflect Barcelona's nearby Olympic Marina. 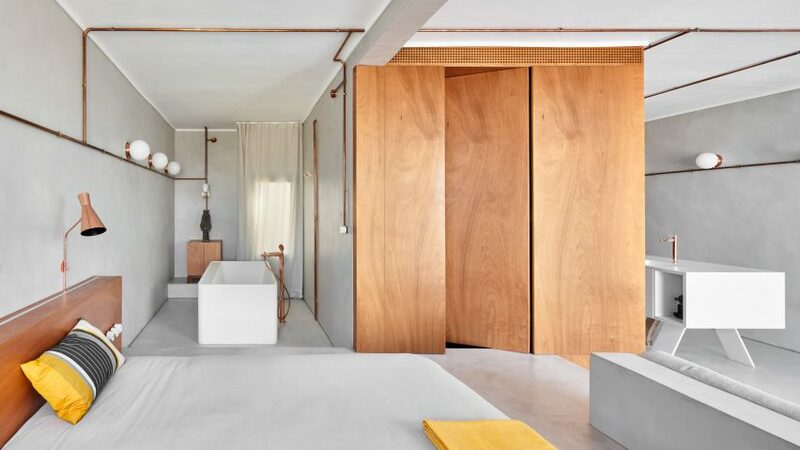 "[The apartment] has been radically remodelled with the same principle of small-sized naval architecture: liberate all utile space from the unnecessary, while only the pure form remains present," the studio explained. Originally built to host sailing competitions during the city's 1992 Summer Olympics, the marina is now a buzzing leisure area populated with seafood restaurants and water sports attractions. 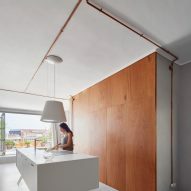 All of the 56 square metre apartment's internal partitions have been knocked through, leaving behind the structural walls. These have been coated with pale grey micro-cement, intended as a reference to concrete docks. 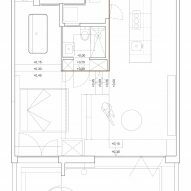 The floor plan is now anchored by a huge wooden volume, much like a ship's cabin, which accommodates a toilet, laundry room, and a series of storage cupboards. 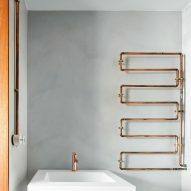 Thin copper pipes that snake across each surface add to the maritime theme, creating what the studio describe as a "vessel-like" aesthetic. On one side of the volume lies the kitchen, which features a long white breakfast island with an inbuilt sink, stove and oven. Further appliances like a refrigerator and wine rack are concealed at the rear of the room behind cabinetry that has been integrated into the wall. Lighting is provided by spherical wall lamps. 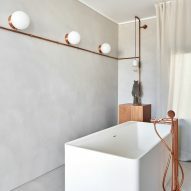 The other side plays host to a wet room, complete with an open bath and copper tap faucets. A short flight of steps leads up to a raised sleeping area, where a mattress has been pushed up against a wooden headboard to form a simple bed. Stone-coloured seat cushions have also been incorporated into the treads of the stairs to form a small sofa. The studio has created a larger opening in the rear elevation of the apartment to provide better views of the marina's waters and moored boats. Inhabitants can push back concertina glazed doors and walk out onto a roof terrace that has been freshened up with bright white surfaces clad in hexagonal tiles, and relaxed corner seating. Much like Cometa Architects, Savvy Studio opted for a nautical theme when designing the interiors of Summer Day Cafe in New York – the restaurant features seating upholstered in sailor-striped fabric, and glossy wooden counters that recall the lacquer on typical sailboats.